Iowa Wrongful Death Emotional Suffering Damages | Hupy and Abraham, S.C.
Can I recover for emotional suffering after the wrongful death of a loved one in Iowa? The grief and emotional suffering that follow the death of a loved one are often the most significant damages that you face after a fatal crash, but they may be among the most difficult to prove. Iowa law may allow you to recover for your emotional loss and for the suffering your loved one endured from the time of the accident until the time of death, but in order to recover these damages, you need to know how to do it. An experienced wrongful death lawyer can help you gather the relevant evidence and fight for the full and fair recovery that you deserve. The suffering your loved one endured from the time of the accident until the time of his death. 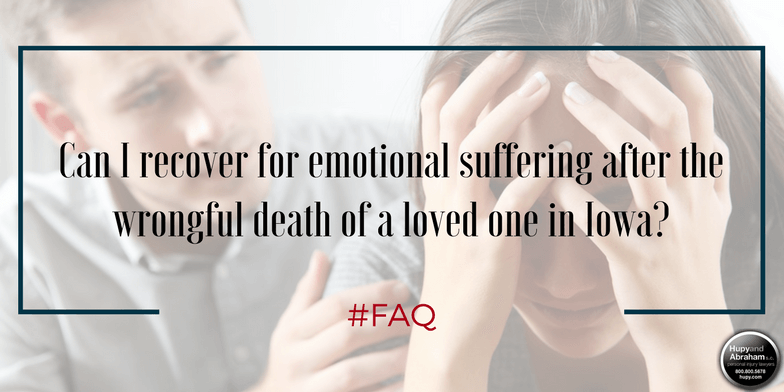 The length of time between the accident and your loved one’s death, how aware your loved one was of his injuries and prognosis, and other factors will be relevant in determining the amount of damages that can be recovered by the estate for your loved one’s emotional suffering. The emotional suffering of the spouse and children. This is included in loss of consortium damages and includes loss of affection. Your loved one’s character, the way that your loved one conducted himself as a parent or spouse, and other factors may be considered by the court when determining these damages. Loss of companionship and society of a minor child. Parents may recover for the emotional suffering that they experience if their minor child dies in a wrongful death accident. The child’s character, personality, and other factors may be considered in determining these damages. These damages may be significant, but they are only part of the total amount of compensation that you may recover in a wrongful death lawsuit. It is important to protect all of your rights going forward. If you would like to learn more about your rights and potential recovery, please contact us directly via this website or by phone at any time.